Geomorphology is the study of landforms and how they were formed over time. 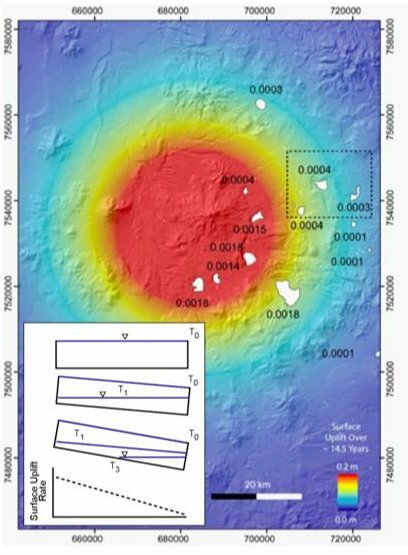 Over the last decade, expanding magma underneath Uturuncu has been causing the surface to rise upward. Is this uplift a unique episode, or is it a long-lived geologic process? Geologists can answer this question by looking at ancient lake deposits! The image shows a color map of uplift at Uturuncu and marks several lakes in the area. A flat sediment layer would reflect a period of no uplift. On the other hand, if uplift has been occurring over a long period of time, the layer will be tilted. 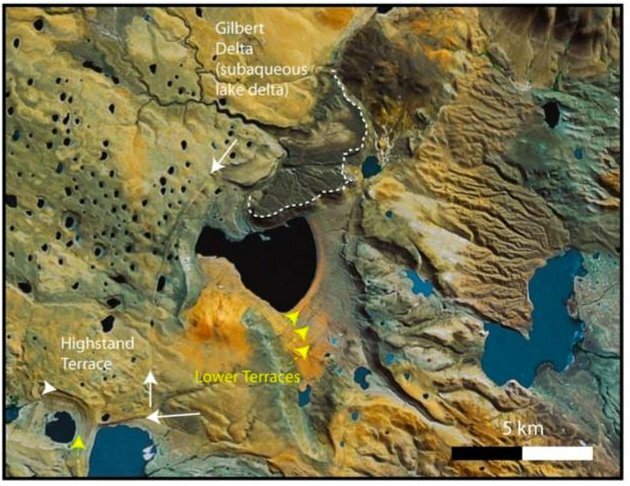 This Google Earth satellite image shows evidence of large ancient lakes around Uturuncu. Past shorelines are indicated by white dotted lines and arrows. Notice the distinctive “delta feature” outlined by the dotted white line. Are they tilted or deformed? Effort led by Noah Finnegan (also the source of the figures). Dr. Noah Finnegan is an Assistant Professor of Earth and Planetary Science at University of California - Santa Cruz. Noah specializes in ‘geomorphology’, and area of geology that sheds light on the evolution of landscapes.